I can't say that I am particularly invested in the Oscars this year as I haven't really seen most of the movies yet. I think they made some good choices, like Sean Penn and Anne Hathaway and of course Heath Ledger. But, I would like to take a moment to address "Wall-E." Certainly one of the most f-ing phenomenal movies of the year, but nobody really talked about it. My 4 year old nephew walked out which just shows what horrible taste in cinema he has. And now, for the second time this award season, the biggest insult of all, it is placed in the same category as "Kung Fu Panda" and "Bolt." "Bolt." I didn't see it, but a dog movie starring Miley Cirus and John Travolta is not something you could ever get me to see, unless maybe it had Nazis or zombies in it. And, while I also didn't see Kung Fu Panda, and I have nothing against the genre of "lazy anthropomorphic panda noodle-shop worker fulfills prophecy to become Kung Fu master," I do feel that its a bit played out. 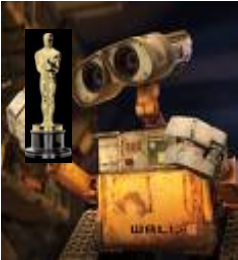 So really, all I have to say is that if "Wall-E" does not win the Oscar in this category then the Oscars will forever lose all of their credibility and no one should ever watch them ever again. Seriously. The Golden Globes did the same thing, but were smart enough to give the globe to Wall-E. Let's hope for the same outcome with the Oscars.